PRODUCT REVIEW AND GIVEAWAY: YARN VIBES! 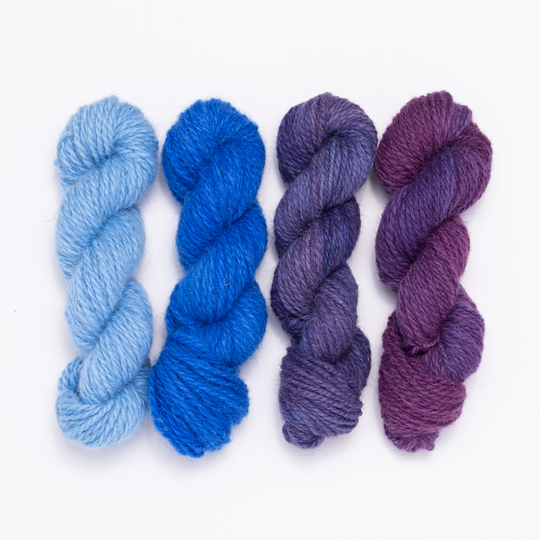 Have you ever picked up a skein of yarn, and sniffed it ('cuz you know we all do that!) and felt SURE you knew what the place it came from smelled like? That's exactly how I felt when I got my hands on some Yarn Vibes recently. I've never BEEN to Ireland, but now I feel like I know what it would smell like. When my box of yarn-y goodness arrived I definitely did a happy yarn dance. Thankfully, my Mother was there to witness it so that cats outta the bag! But I just have to share how thoughtfully the package was wrapped up. I love pretty mail! Not only did I get lovely yarn but a brand new canvas tote - which I'm pretty sure a knitter can never have too many of! Let's talk about the yarnz! Yarn Vibes is, proudly, 100% sheep-to-skein Irish yarn! If you haven't already heard of them, go check out their story HERE. I think you'll be inspired by their desire to create something unique and beautiful, while maintaining traditions AND staying on color trend. I was sent two lines of the Yarn Vibes yarn: Vale and Hedgerow. Both yarns are a single ply, sport-weight yarn, but they are packaged differently. The Vale line is what I think of as a "traditional put up" - a 100g skein of yarn, sold independently. 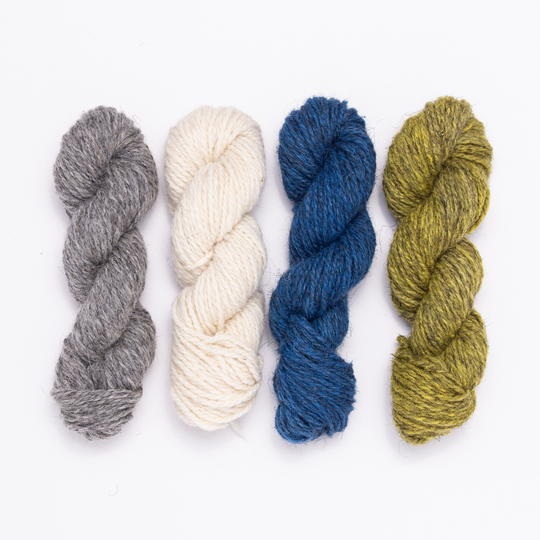 The Vale line comes in 8 different colors and is available in sport and worsted. I'm told that the worsted is 2-ply: 2 plys of the single-ply sport weight, plied together (can I say "ply" more?!). The sport weight is 300m / 328 yds per 100g / 3.5 oz The worsted yarn is 150m / 164 yds per 100g / 4.23 oz. I received two skeins of Vale in the Sea Foam and Slate colorways. I'm not gonna lie - they're so gorgeous I haven't had the heart to wind them yet. I just keep petting and sniffing them. But I'm pretty sure they're going to become a cowl because I need this in my wardrobe ASAP! 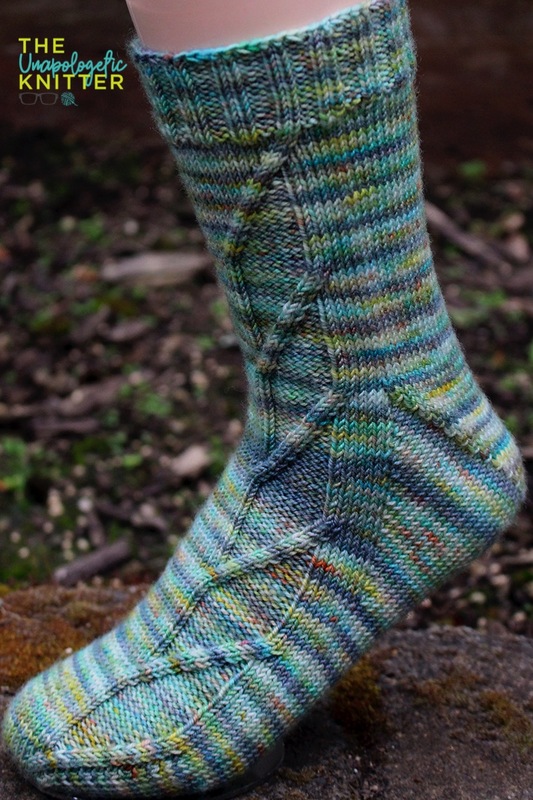 The Hedgerow line is the perfect package for folks who love colorwork! Available in both sport and worsted weight, each package comes in 4 complimentary colors that can be knit up in hats or mitts or scarves. Each color combination is inspired by a different set of colors found in Ireland. Check out these gorgeous combinations. From left to right: Blackthorn, Hawthorn and Rosehip! And lest we forget, my personal favorite, and the color kit I was sent: GORSE! My lovelies... I can't even handle how saturated each color is. And they're perfectly color fast (not a single bit of dye leaked when I washed my swatch). Ok - but how does it FEEL? This 100% Irish wool is what I think of as 'rustic'. It's not like picking up a skein of superwash wool that is smooth and has a smooshy hand feel. This yarn has texture and strength. There's an inherent durability to this yarn that I adore. It's feather-light once knit but doesn't collapse. As you knit you'll probably find tiny bits of shrubbery and I kind of dig that. It tells me that these sheep did stuff. I mean, maybe not like weekly yoga classes or anything, but they hung around in the outdoors and did... sheepy things. Lets talk durability for a second! This yarn, despite being a single ply, can stand up to a beating. I played with some colorwork and ripped it out not once, not twice, but 3 times and this yarn held up like a champ! And the more I worked it, the softer it became. This is a yarn that I know I'll be using for outerwear. Its light but super warm and if I haven't said it already... oh my gosh the colors! They're SO saturated. I can't even handle that teal and chartreuse!? Come. On! So! With all this awesome chatter about this new yarn, let's get down to getting some into your hands! The lovely (and super generous) folks over at Yarn Vibes, have generously offered to send a set of Hedgerow to a winner. To make what, you ask? How about a hat?! 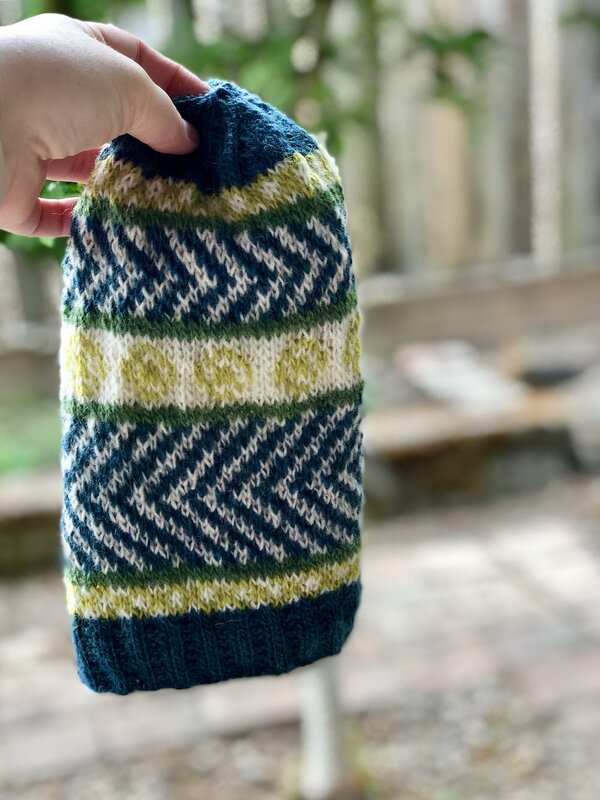 Because I can't get new yarn in my hands and NOT knit it up immediately, I designed up a 4-color hat using the kit of Hedgerow I received. This pattern will be dropping in a couple of weeks but one lucky winner will get an advanced copy along with a kit of Hedgerow to make their very own. Here's a sneak peek! Comment below on what your favorite Hedgerow color combination is (Hawthorn, Blackthorn, Gorse or Rosehip) and leave your Ravelry name. I'll be choosing a winner on Thursday next week (September 6th) and announcing over on Instagram Live who our winner is. As the winner, you'll be contacted via Ravelry to get your shipping address, and some goodies will come your way! This is open to EVERYONE - not just Ireland or the US. So, drop your info below and get this awesome little treat! 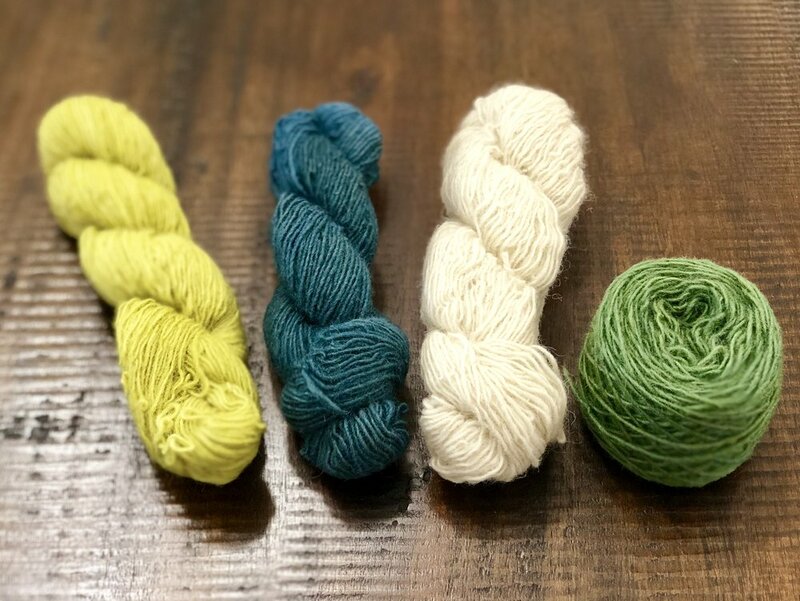 Thank you for stoping by to check out this awesome new yarn line from Yarn Vibes. I hope you'll check out their website, give them a follow on Instagram (@loveyarnvibes) and try out their yarns. I received skeins of Vale and Hedgerow from Yarn Vibes, free of charge, in exchange for an honest review of product. The wording and opinions above are my own. Oooh doggie it's hot here! We've had 90+ degree (that's 32+ degrees to everyone not living in the US) heat for 2 weeks in a row and I feel like I'm melting. The only good to come of it is that my tomatoes are HUGE, my pepper plants are exploding and my hand knits block dry in about 2 hours. This amazing pair of socks is the result of a collaboration match made in heaven. I worked with Blue Moon Fiber Arts to design a new pattern for their Rockin' Sock Club 2018: Magical Mystery Sock Tour. The inspiration was Mists of Avalon - one of my favorite books! 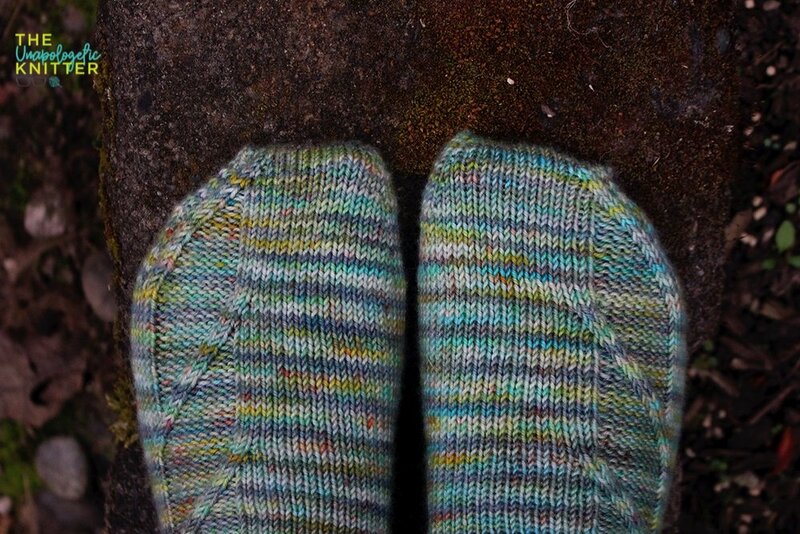 Which is convenient because these are, hands-down, my favorite toe-up socks I've ever designed and knit. Wanna get yourself a pair? You can purchase the pattern here on my website, or on Ravelry. This weekend only, save 10% at checkout using code SocksOfAvalon (ends at 11:59 pm PST on Sunday, August 5th). Inspired by the White Stag of Arthurian legends, also known as the White Hart, the traveling stitches in this sock make me think of antlers, perhaps those worn by the White Stag himself! ff. Written instructions or links to tutorials are provided for each technique. These socks are mirrors of one another, and the pattern section varies in size based on the size of sock being knit. Be diligent in following sizing to ensure you are using the instructions/chart for the size of sock being knit. Each chart and written set of instructions indicates size. Instructions are provided for the smallest size, with larger sizes in parentheses. When only 1 set of instructions is provided, it applies to all sizes.